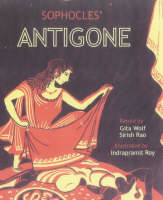 A retelling of Sophocles' tragedy of the fate of Antigone, who defies her uncle and buries her brother. The text is printed on handmade paper and the volume is slip-cased. The original silk-screened illustrations have a classical Greek flavour.